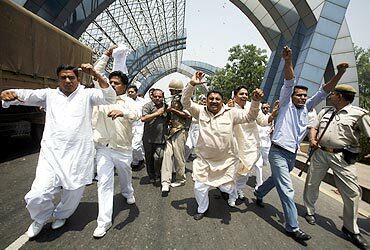 Uttar Pradesh Chief Minister Mayawati on Thursday accused the Congress and other opposition parties of attempting to disturb law and order by spreading rumours on land acquisition and dubbed Rahul Gandhi's dharna in Greater Noida as "mean theatrics". She said the clashes in Bhatta Parsaul in Greater Noida had nothing to do with the issue of land compensation. "By spreading lies and rumours, opposition parties are attempting to disturb law and order situation by misleading people and Bhatta Parsaul incident is an example of their dirty politics," Mayawati told mediapersons in Lucknow. She accused Congress leader Rahul Gandhi, who staged a dharna in Bhatta on Wednesday before being detained and released, of indulging in "mean dramatics". 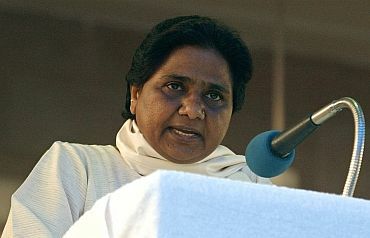 Mayawati said that whatever Gandhi has to do on the issue of acquisition of farmers' land, he should first do in his party. 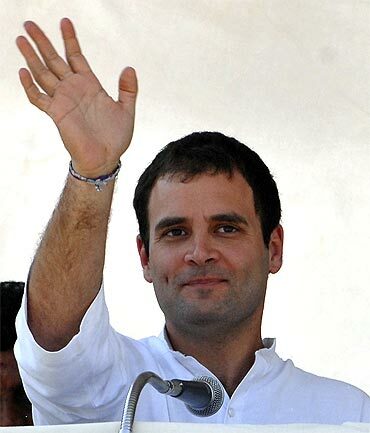 "I would like to tell 'Yuvraj' that whatever struggle he has to do, he should do in his home first, as the decision is in the hands of the Centre." "It seems that he is not being heard in his own home and he is venting his frustration by indulging in mean dramatics," she alleged. Mayawati said that from time to time the cabinet secretary has on her behalf clarified the situation, but still an attempt was being made to mislead people by associating the issue with land compensation. The UP CM said the land was taken for development under masterplan of the Greater Noida Authority. "I strongly condemn false publicity despite repeated clarification," she said. Mayawati said that farmers in Gautam Buddha Nagar gave their land to Greater Noida authority way back in 2009 and had taken the compensation. "From this it is clear that the incident had nothing to with the compensation. This is dirty politics of the opposition parties," she alleged.